“The psychoactive properties of cannabis can help people to revisit the traumatic event and deal with it in an altered state where they can recreate or renegotiate the relationship with the problematic pathways of the neural network, which changes the way the memory is experienced” said Zoe Helene, an artist and cultural activist who runs Cosmic Sister, a feminist advocacy group that employs cannabis and other psychoactive plant medicines to address both individual and collective trauma. 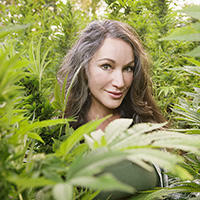 Having suffered from PTSD from the age of 18 until her early 40s, Helene said she believes marijuana can be used much like psychedelic substances to go deep into what she said the ancient Greeks called the “psyche” and unravel the mechanisms that keep people locked in the grips of disorders like PTSD. Research has shown that THC can modify brain plasticity in protective ways while CBD is able to stimulate the growth of new neural cells of the brain that were damaged by stress. Ocean Malandra is a widely published writer that divides his time between Northern California and South America. His coverage of cannabis has appeared in High Times, Vice, Massroots, Leafly, Prohbtd, Paste Magazine, Reset.me and now WeedMaps News. Follow him on Twitter at @OceanMalandra.